The detailer said that I had been at sea too long. Either ships or foreign soil accounted for all my time from 1962 to 1970. I was going to shore duty whether I liked it or not. He had a job that the Bureau (of Medicine and Surgery) was bugging him to fill. There was a Navy Unit at the Army Germ Warfare Center, at Fort Detrick, Maryland. For some reason they needed someone with a degree of proficiency in both Medicine and Submarines. Why not. I was considering swapping over to the Coast Guard to get back to Independent Duty on a small ship and this would kill the time until I could. When I arrived the Assistant Officer in Charge, A Lieutenant Commander (LCDR) who was a microbiologist in the Medical Service Corps explained the problem to me. It seems this unit was responsible for developing strategies for the decontamination of any unit that was assaulted with Germ warfare. If they had a submarine that was contaminated, even if it was full of dead sailors, we needed to be able to figure how to clean it. Our method was to burn off formaldehyde from a crystal to a gas and circulate it everywhere in the air. Would that damage electronics? Probably not - one way to tell. How to introduce the gas required a drawing of the ventilation system of a sub. 4 hours and problem solved. Now another problem. What do you do with a 26 year old Petty Officer who refuses to just sit around. As it turned out there was a portion of the base safety department that dealt with radioactive trash. When a scientist uses a radioactive isotope to tag a molecule that will be used in a test animal, the radioactivity does not go away by magic. For the year I was there I was the strong back in that department. I was the trash man for the radioactive research in that base. Actually, there was more. We were responsible for getting rid of this stuff. We could dump the liquid in the sewage system when it had decayed enough. I had the fun of doing that and taking samples from the river to ensure we hadn’t messed up. ​The base was in turmoil due to a reduction in force brought about by President Nixon. He converted our germ warfare to defensive only and a batch of PHDs lost their jobs. Then there was that other thing. Something about the Apollo Moon Landings. When the Astronauts landed on the moon we had to assume that there could be biological life there. When they returned they had to be quarantined for about a month and someone (us) took sample swipes of the lander module, the helo that picked them up, the pathway provided for them into the quarantine module, and who can remember what else. All that also had to be decontaminated. ​ I have memories of driving all over Hawaii with her (thanks gg if you're reading this) and her youngun(s) in one of these early Hondas. I really enjoyed that. I had not seen her in years.That unfortunately is a situation that has repeated itself. Google Images, probably not on the New Orleans but they are all pretty much the same. On our way to American Samoa for the splashdown we crossed the equator and endured the indignities that one must to become a shellback. oo urtesy of google images: The always beautiful royal baby and some poor pollywog. The cooks always throw together some edible and sanitary stuff that they make look like garbage. You have to eat that off the the royal baby’s stomach. Having recently toiled in our submarine service I just dived in. I was rebuked and offended and the royal baby asked me if I had any idea how sore his stomach was. I think my laughter offended him. Shortly after crossing the line we were in the splashdown area waiting. There was something called the GE bubble that handled the transmission of the TV signal. It functioned much like a moonwalk for kids does today. It had a bandaid on the bubble for every craft it had picked up. I only remember the Apollos (all of them) but it may have had Gemini as well. For all those who say we never made it to the moon... I wasn’t there but I did hear a boom and saw it parachute in from somewhere. 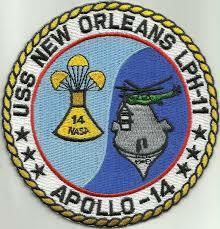 This picture is of Apollo 14 as the seals assisted the Astronauts getting out of the recovery module. ​This brow (steps, if you must) was pushed up to the chopper. The walk was lined with paper or plastic and when the Astronauts passed through, the paper or plastic was rolled up and isolated to be decontaminated. My job required me to be very close to this action but not involved in it. When that was done my boss and I began to decontaminate the helo. I have no recollection of who might have taken this picture but I wasn't more than 10 feet behind the guy in the blue jumpsuit. So much for almost getting my 15 minutes of fame. 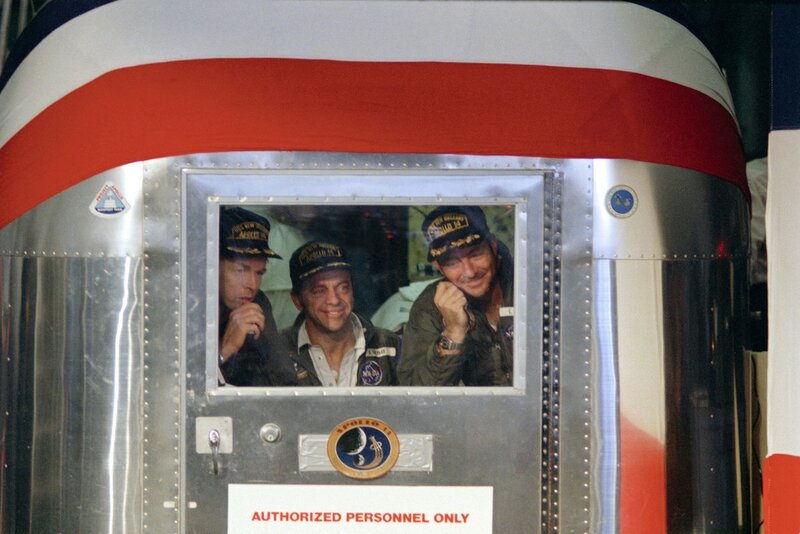 I think the Astronauts were taken back to Houston inside this little compartment. Anyway, they spent the next 30-40 days in it somewhere. If I remember correctly we blew gaseous formaldehyde thru the helicopter and the module. The outside was certainly germ free due to the heat of reentry. The inside was not. We took swipes of some areas before decontaminating the inside. I know that moon landings started with Apollo 11. When there were no positive readings between 11 and 14, the powers that be decided that moon bugs did not exist. We were the last decontamination team sent by our unit. I sometimes wonder how we know that we didn't encounter germs with a 50 year incubation period. It would not have gotten a reading of significance on our specimens and could be just ready to pop out now. You do have to draw the line somewhere and I think they chose well. We returned to Fort Detrick and not long after that, I was selected for the 3 year advisor program for Vietnam area advisors. I went to Fort Bliss in El Paso, Texas to learn Vietnamese. A year later I was in Panama as President Nixon gave my job away. Bummer. Should have focused on learning Spanish.